Snail mail is pretty awesome, we can all agree on that. Right? Everyone loves the feeling of getting an envelope in the mail with their name on it (of the non-bill variety). The excitement is real. Well, why not share this glorious ritual with the kids in our lives? 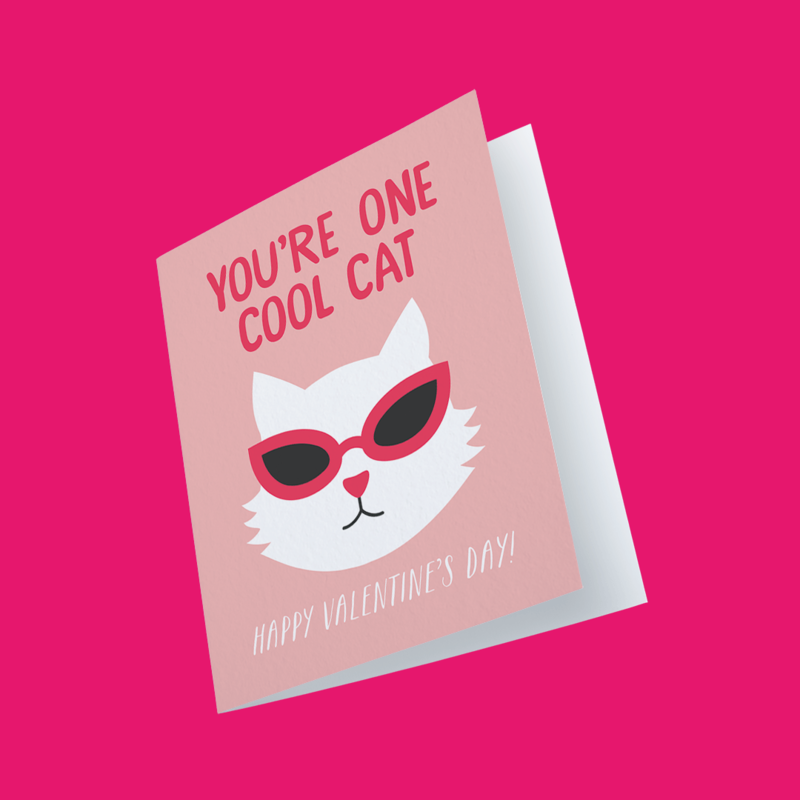 There are about a million reasons to send a card to someone (here are 67 reasons to get you started) and sending greeting cards for kids is no exception. They’re people too, you know. 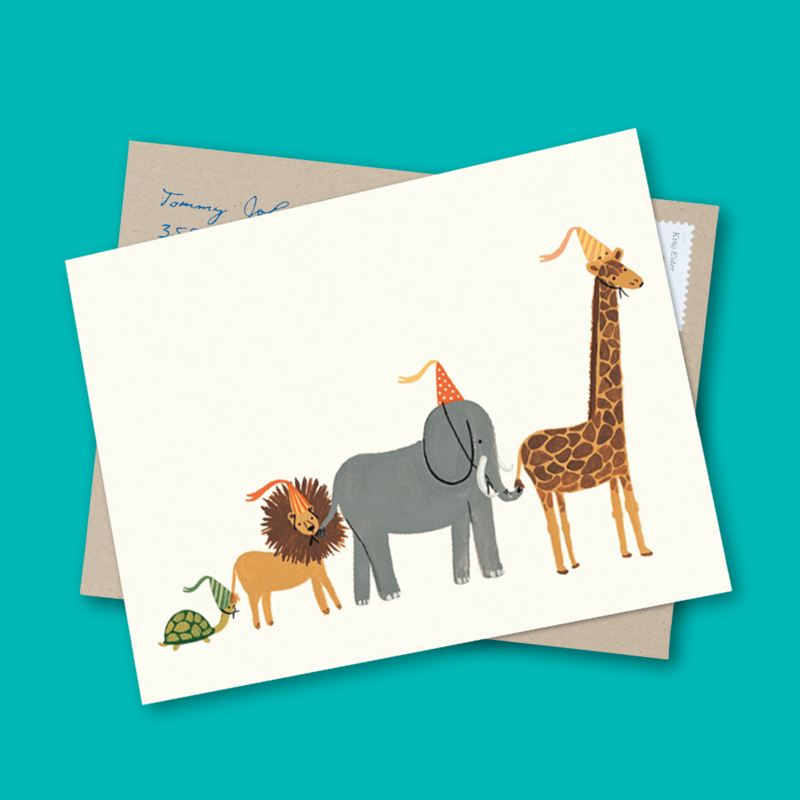 Sending cards to kids can be a great way to introduce them to the lifelong habit of writing proper thank you cards and can even play a role in helping kids practice to read (and write)! 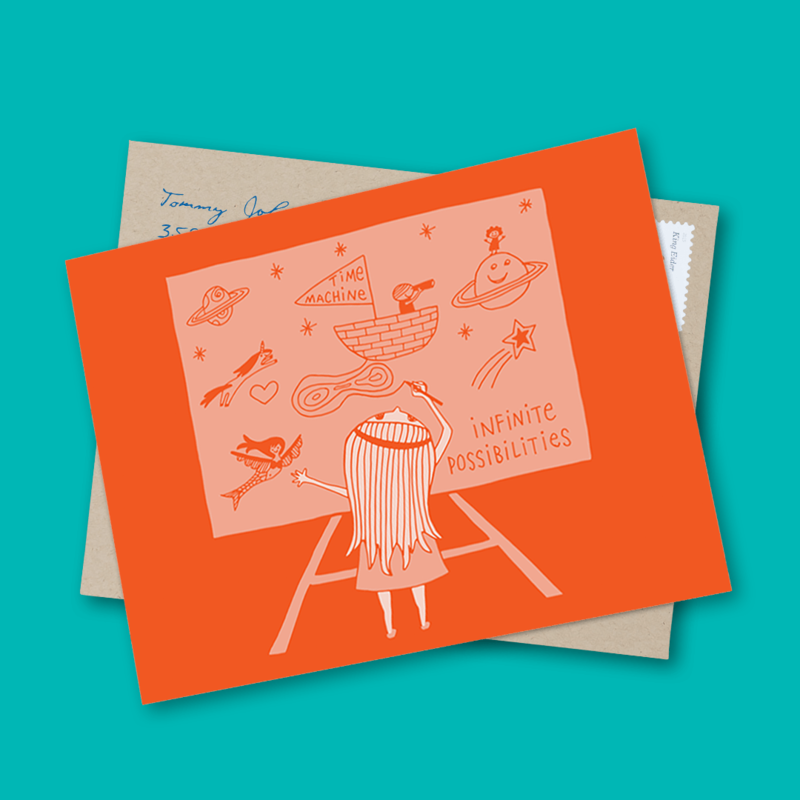 We’ve come up with some cards from Postable’s collection that you can send to the kids in your life! Everyone should feel extra special on their birthdays. Especially kids. While adults may welcome each birthday a little less enthusiastically as time goes by, kids will count the days until they get to be a whole year older. It’s kind of a big deal, so why not treat it as such? If for no other occasion than the birthday, a kid should know how special it feels to get snail mail. Birthday cards are a must (a present definitely wouldn’t hurt either). 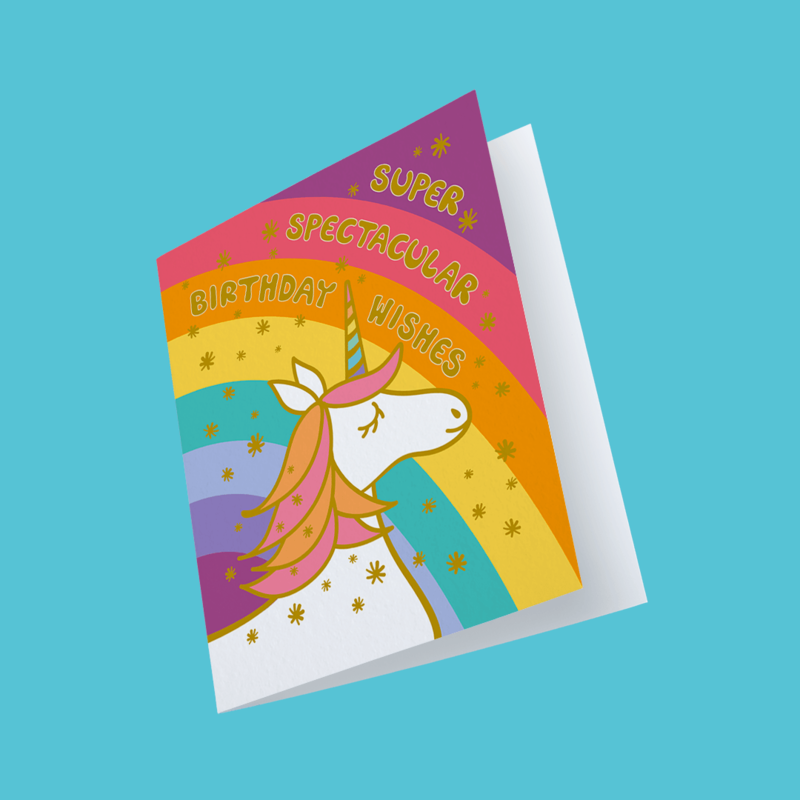 Checkout these delightful birthday greeting cards for kids and see for yourself how adorable they are (we know some adults who wouldn’t mind getting some of these in the mail either). Ok. so who wouldn’t want to get super spectacular birthday wishes sent to them? Let your little nephew, cousin or the neighborhood kid know that they’re about as spectacular as a unicorn could ever be. Also, how fun are these colors on this kids birthday card?! This painted birthday card is perfect for a little one. Also, how cool would it be if these balloons were real? We love the vintage feeling so much we wouldn’t mind framing this little card to keep as a lovely little memory. 3. Birthday Girl Power Card by Night Owl Paper Goods Know a little girl with an upcoming birthday? 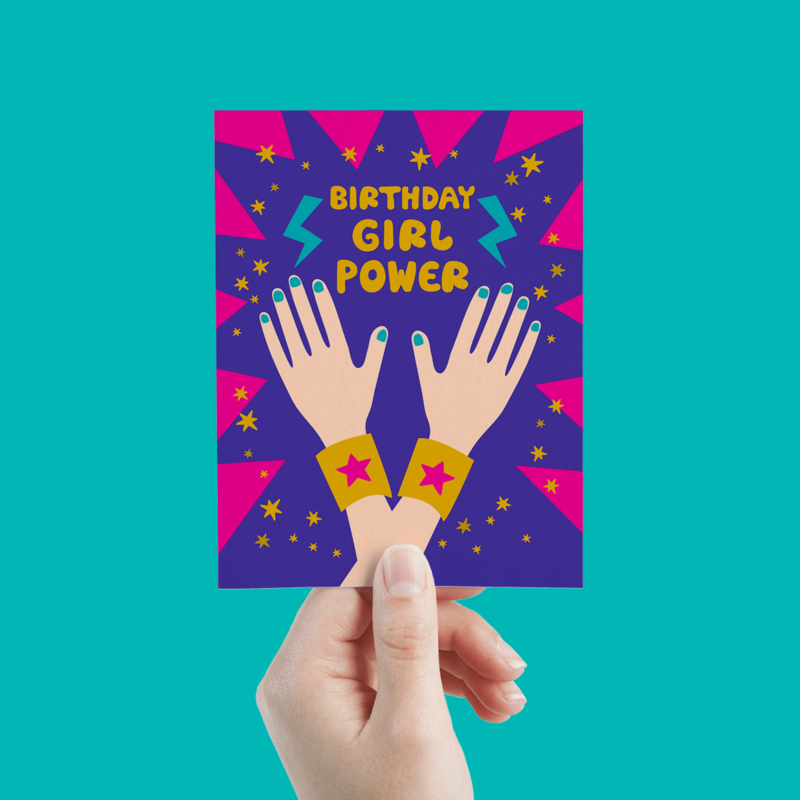 This girl power card is perfect to inspire her on her special day. It’s important she knows how much power she has. Go ahead, be the one who reminds her of just that! As with most any of these kids birthday cards, you can also send this card to any adult in your life. You’re never too old for a little girl power inspiration. More fun colors from Night Owl Paper Goods (these never get old). Know a little someone who spends every waking minute in the pool pretending to have fins of their own? 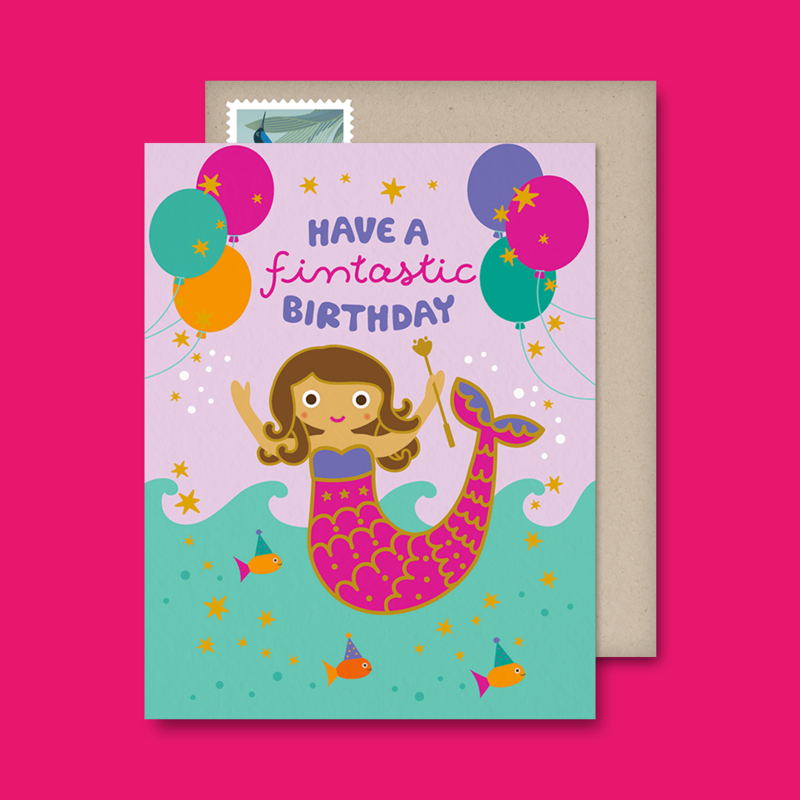 This mermaid kids birthday card is perfect for the little swimmer in your life. 5. 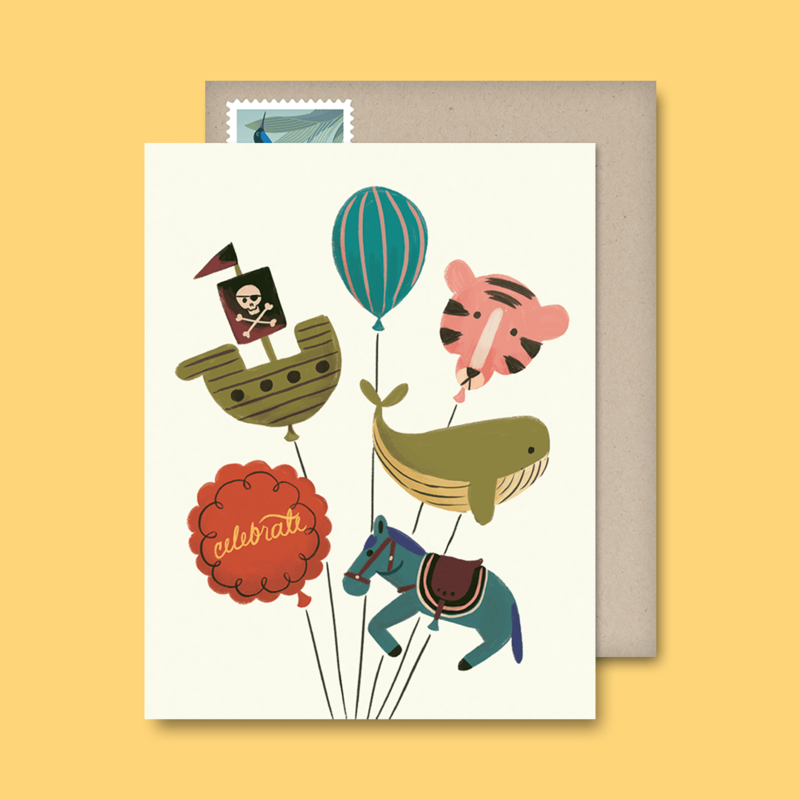 Animal Parade by Rifle Paper Co.
How adorable is this hand painted kids birthday card? For the little one who falls in love with every little creature they see. Simple, but oh so adorable. Puns may be a little hard for the super young ones to understand, but a quirky card like this can be a great opportunity for them to learn the magic of puns. 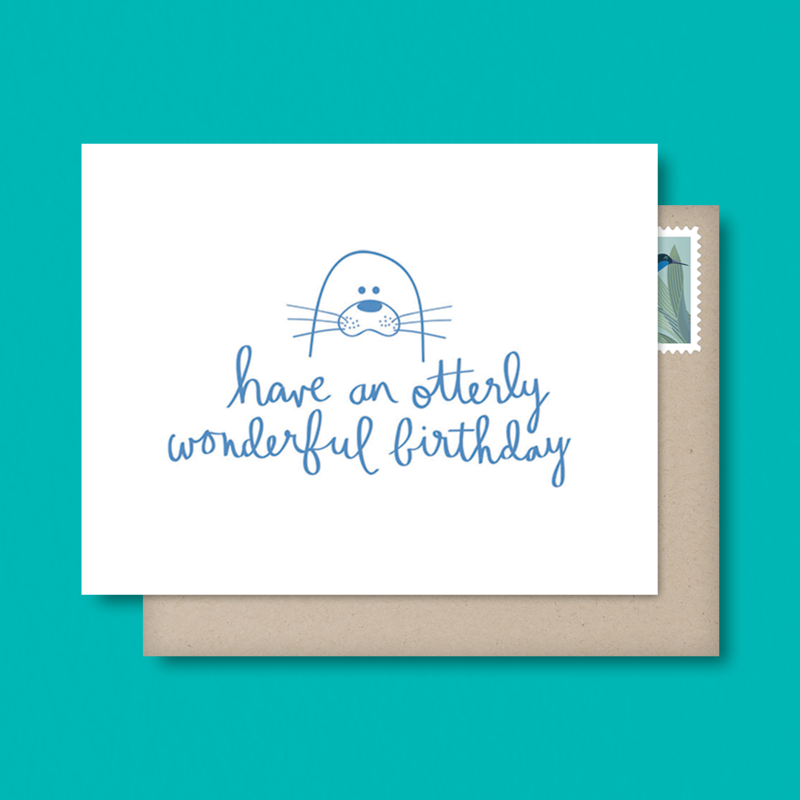 Your little one will be giggling for days with this punny birthday card (after they learn what utterly means). The big day of love isn’t just for the romantics. The kids in our lives adore Valentine’s Day just as much, if not only just for the copious amounts of candy they’re surrounded by. Great opportunity to show the little ones just how much love they’re surrounded by on the daily, but especially on Valentine’s Day. Photo templates are great opportunities to include a photo of either yourself, your cat (in this case especially) or even their little faces for a little added fun and personalization. Kids love seeing themselves and this is the perfect place to do just that. 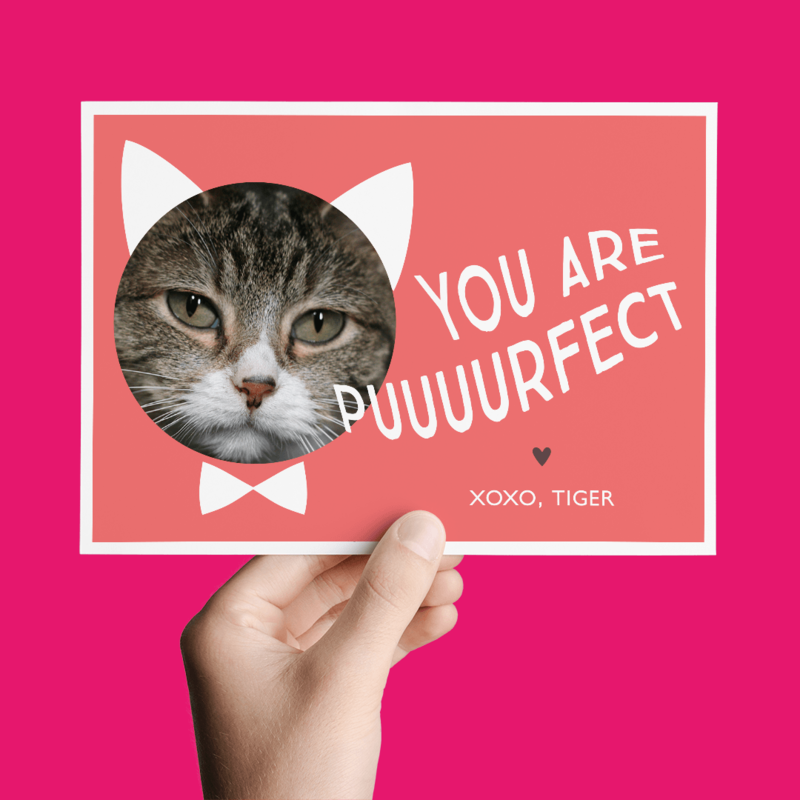 Much like the cat inspired love card, this cute photo love card will make your little ones giggle with glee. 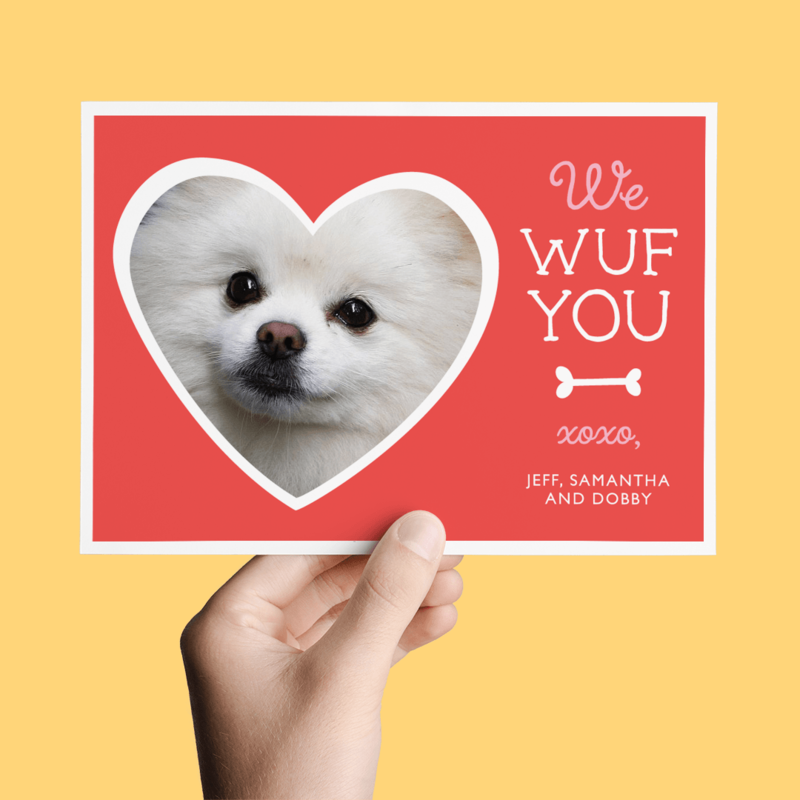 Stick a photo of the family pet or their cute little selves for the perfect Valentine’s day card for kids. They may not know the source of this cool cat saying, but nevertheless they’ll understand how much you care! When we do something awesome we get congratulated. Shouldn’t the same be true for the kids in our lives? Definitely. Their accomplishments are usually far cooler than those of their adult counter-parts (loosing a tooth is so much more exciting than filing your taxes). 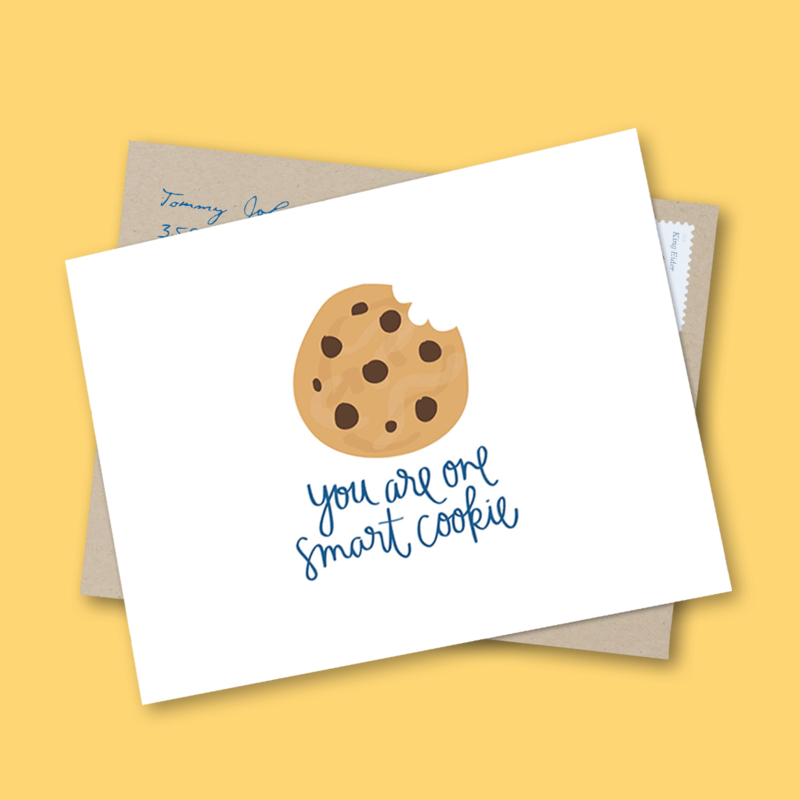 Make sure to let them know how proud you are of them with one of these delightful congratulations greeting cards for kids. Loosing your teeth is a big deal and should be treated as such. Congratulate the kiddo in your life for growing up so quickly (it is hard work after all). Remember how hard it was to be in school? Perhaps you’re still chugging along on your own education so you’ll totally understand how awesome it is to get those A’s (or B’s or whatever). Make sure the little ones in you life know that they’re exceptionally smart when they succeed on an assignment. Or you know, any other time at all whatsoever. It’s nice to get reminded that someone thinks we’re smart, especially when we’re itty bitty people. Another pun-masterpiece from A Jar of Pickles. 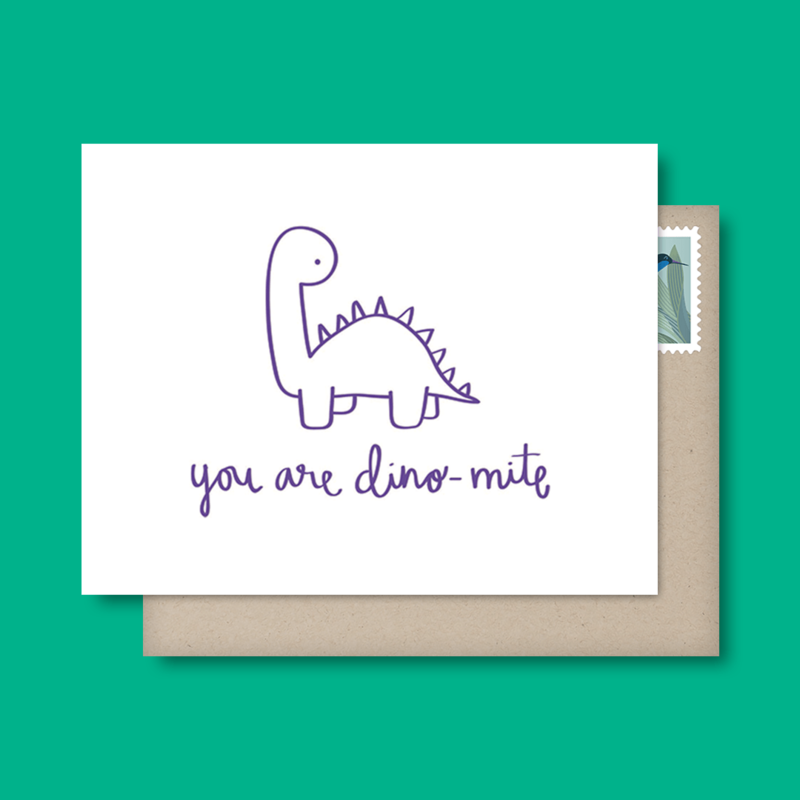 Sometimes you don’t need any other reason to congratulate someone other than for being awesome or in this case Dino-mite ;). 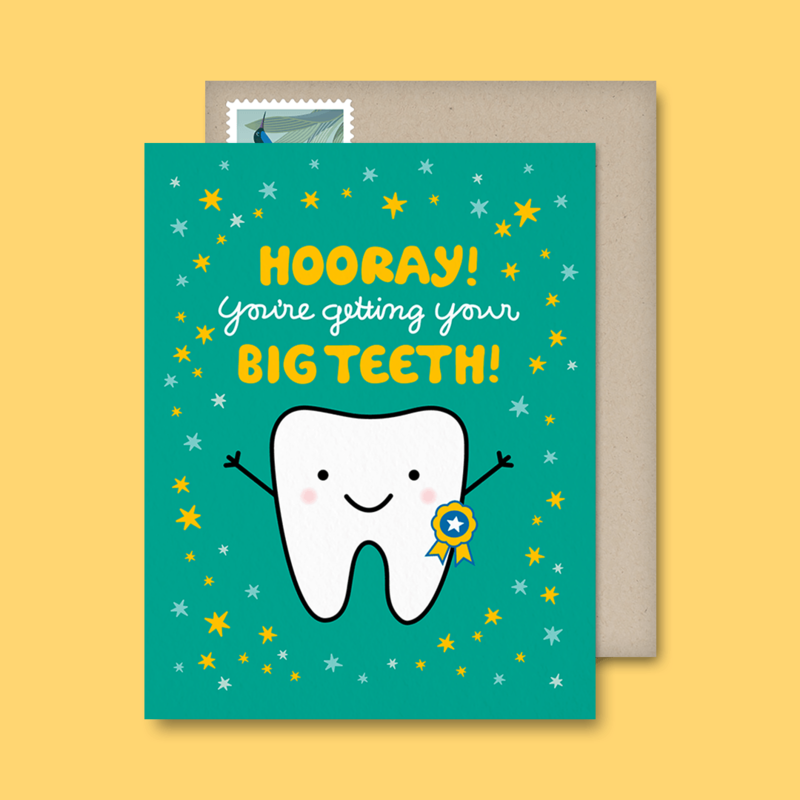 This bright congratulations card is perfect for kids. It’s fun and colorful and will get just about anyone excited about doing something awesome. 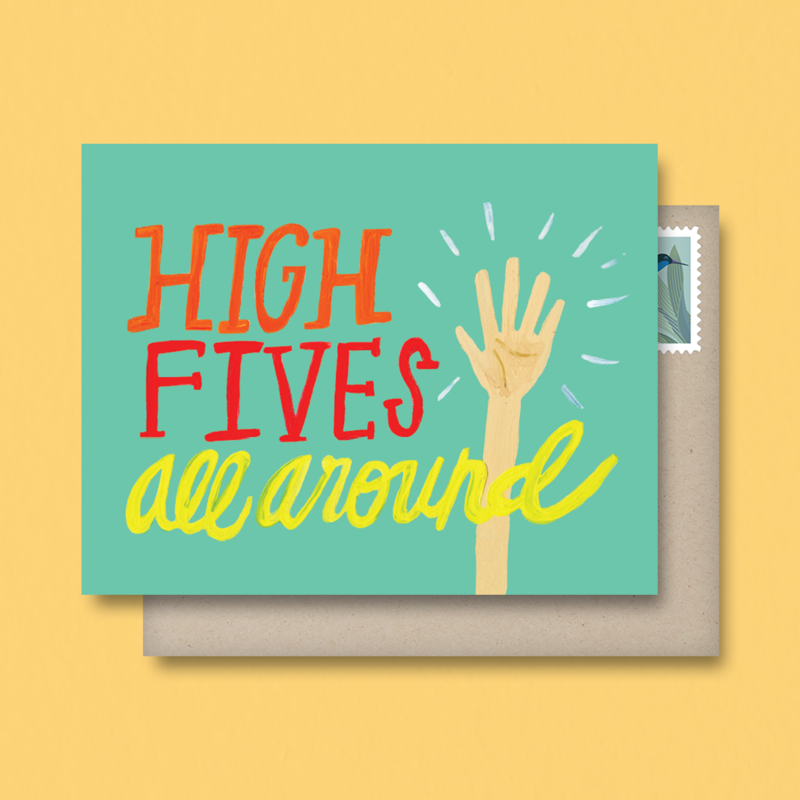 You don’t always need an occasion or an achievement in order to send cards to your favorite kiddies. Sometimes you’re just thinking of them or want to remind them that they’re loved. 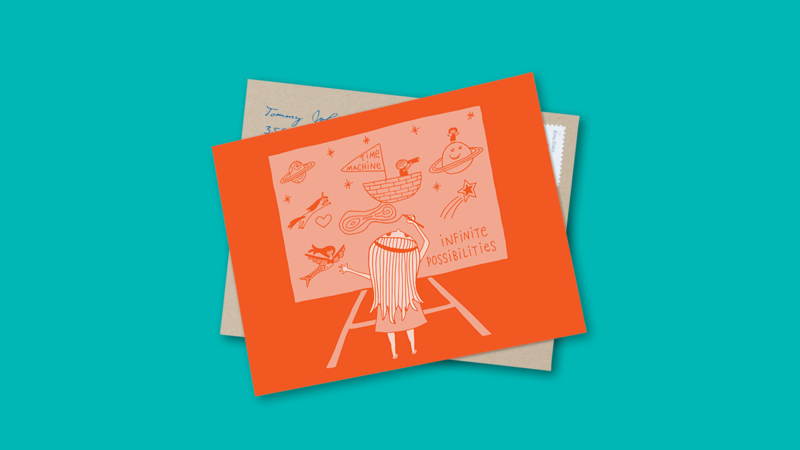 Sometimes kids (and definitely adults) need a little reminding that the possibilities are truly infinite. We all need a little reminder to reach for the stars. 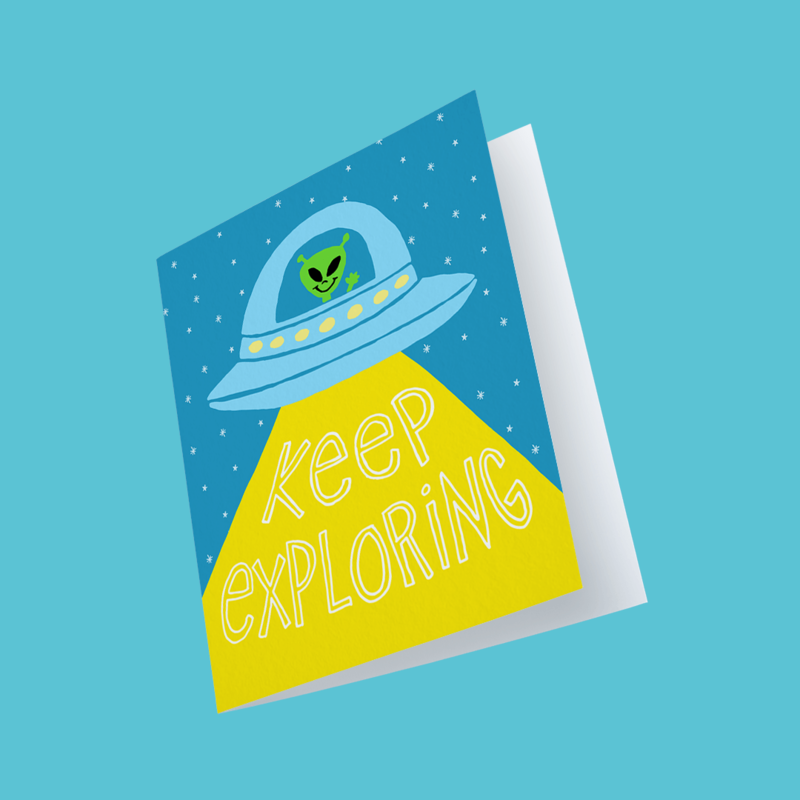 You can encourage the kids in your life to use their imagination with a simple greeting card like this one. A small gesture that can go a long way. 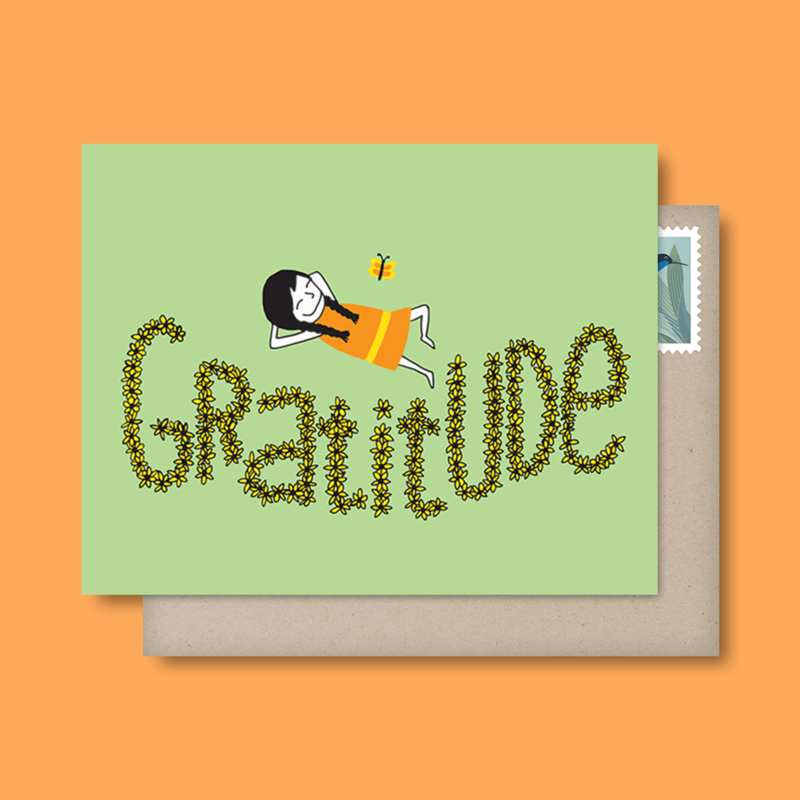 Teaching kids the value of thank you cards couldn’t be easier than addressing a thank you card to them. Teach by doing — as they say. 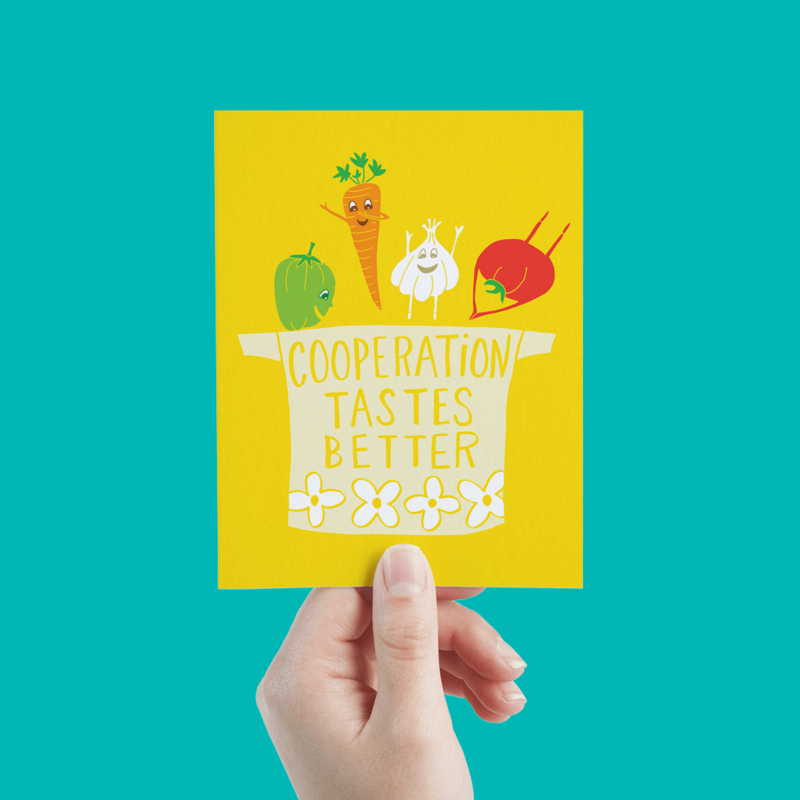 This cute thank you card is the perfect little card for kids to learn how nice it feels to get a thank you card from someone. Snail mail can also be a great tool to teach kids a lesson or two. Know someone having a hard time playing well with others? Who knows, maybe a cute little card like this one with a short personal message inside can go a long way. Postable works with some of the most talented designers out there. Really, we do. Take a look for yourself at this list of awesomeness (aka our artists). 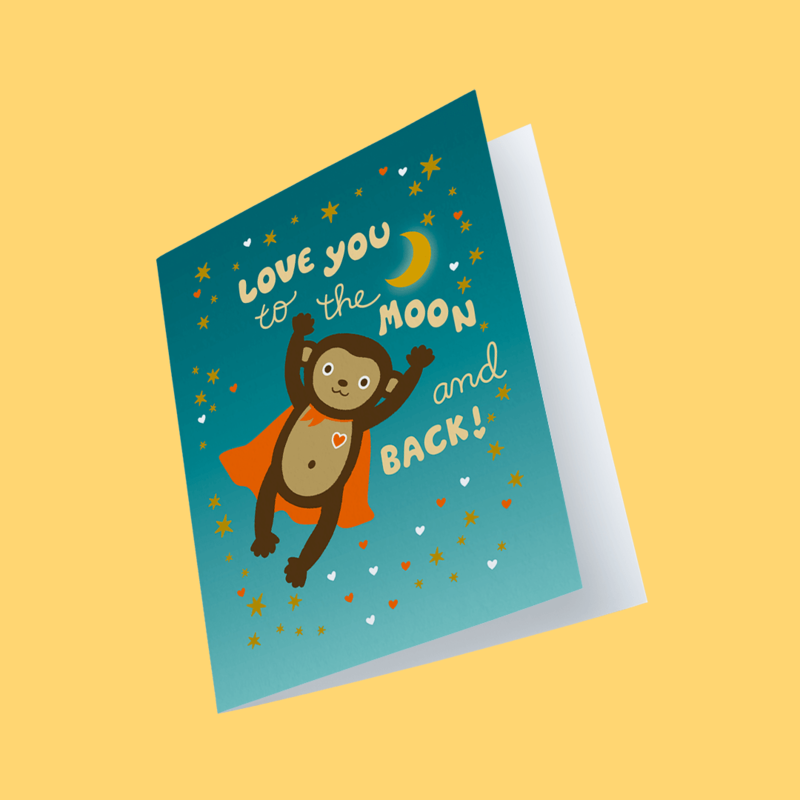 The highlighted artists in this post, while very unique in their own way, have a fun and delightfully quirky feel to every card they create perfect for greeting cards for kids. Night Owl Paper Goods finds inspiration in the natural world. Quill & Fox evoke a sense of nostalgia with quaint illustrations. Rifle Paper Co.‘s famous designs are beautiful and loved by all ages. A Jar of Pickles, a master of puns, keeps her illustrations simple and mighty giggle-inducing. Thimblepress designs exude all the friendliest feelings. Finally, there’s Wildhorse Press with their adorable illustrations perfect for teaching kids life-long lessons of exploring! These artists and many more make up Postable’s bewitching collection of cards that you can send without ever leaving your computer. uh oh! Sorry to hear you’re having issues with the site. If you email info@postable.com, they’ll help take care of you asap.